The Jazz Spivs will bring the revelries – that’s a guarantee. But we also want to give our hosts a fun-filled experience that’s right for them. Instead of offering the kind of generic set you could get from any old band, we’ll happily fine-tune our show to cater for 1920s band ideas and ensure we slip in seamlessly with the party surroundings. Before we arrive to kick-start your celebrations, we’ll ask you exactly what you’d like to see and hear in our performance. Jazz is our speciality for sure, but there are plenty of variations that make this genre so versatile. “Flappers” is the term used to describe the female dancers who accompanied jazz bands on stage in the 1920s and lit up movie screens thereafter. Invariably dressed up to the nines with funky hairdos, feathery skirts, and fine jewellery, flappers never fail to get the festivities in full swing. 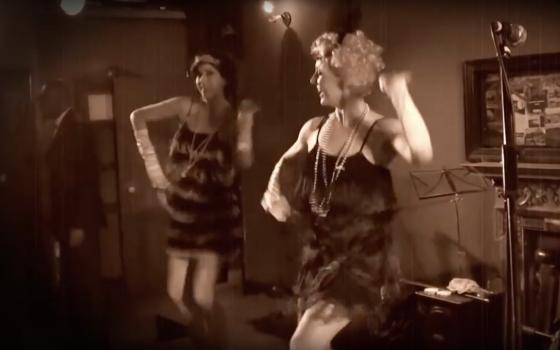 When you book The Jazz Spivs we can bring along a bunch of enthusiastic and enormously talented dancers to give you the ultimate 1920s experience. New Orleans style jazz was developed at the turn of the 20th Century, and came to be associated with many pioneers of the genre such as The Marsalis brothers, Louis Armstrong, and Sidney Bechet. The Jazz Spivs can recreate the classic New Orleans style songs to infuse a charming slice of twenties nostalgia into your party celebrations. We’ll have everyone in the room clicking their fingers and shaking their shoulders from the moment we climb up on stage. The Jazz Spivs have the energy levels to keep your party jumping late into the night, but we’re also equally skilful when it comes to slowing things down. We can pay testament to the great crooners of American jazz and provide a gentle-moving musical atmosphere that’s ideal for romantic slow dances in a more chilled-out setting. Our renditions of the old crooning classics are guaranteed to have your party crowd swaying in glee. Nothing captured the loud, lavish party vibe of the roaring twenties better than F Scott Fitzgerald’s seminal “Great Gatsby”. With our special themed packages, The Jazz Spivs can make your party look as though it was lifted right off the pages of the iconic American novel. We’ll bring the costumes, the tunes and the irresistible 1920s spirit. All you need is your dancing shoes. These are just a few of the 1920s band ideas that can bring your party to life, but if you have any particular requests for songs, themes or performance styles, feel free to give us a call on 0800 756 5512 or drop us a line using our contact form. We’re always eager to hear your suggestions and help make your party one to remember.